Last of the snowdrops and heading back to Pakistan. So, hopefully the sweet peas are nearly out there and there are some strawberries in the shops. All a bit earlier than here. This one sold off the easel and I going in the post! What a wet, dark day! The studio is a little dim even though one whole long side is glass. So, I’m painting cheerful narcissi and trying to keep it loose and fresh! 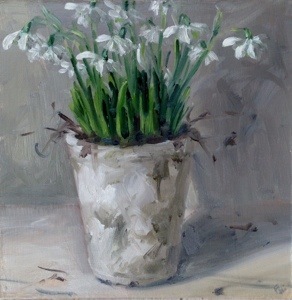 Will post soon but in the meantime……more snowdrops. I’ve had another day out of the studio today but as I was catching up with friends, I didn’t miss it! A very long walk (we are training for the moonwalk) followed by a long and delicious birthday lunch for one of the gang. Bliss. It’s a good job I did this one in advance. The end of my eggphase. I have been prepping boards today and they might just be dry enough by supper time to eat at the table! Have a lovely weekend………snowdrops next week. And………we’re home. Cold, need haircut desperately and looking forward to Waitrose visit. I pick-up my girl tomorrow and one son is home for a break too……that warms the house and the heart. The bounce is some new lambs in the field behind my studio. I’ve spent the morning packing up paintings for those lovely buyers who allow me to carry on doing what I love. Thank you all. Right, Waitrose. I hear those Edamame beans calling. I’m heading back home for half-term and am hoping it won’t be too cold…..wishful thinking. Will post again once I’m the right side up. Exciting news! I am Country Living magazine this month. I haven’t seen it yet but hoping there will be a copy on my doormat when I get back to the UK later this week. So looking forward to seeing it and to painting some snowdrops and maybe even some snow or has it all gone now? I’m back from my short trip to Amritsar (photos below) which was action- packed and fabulous. If you are considering going, hesitate no longer, the golden temple is magical. Painting friends, I am going to look into possibility of painting there. Not sure of protocol yet. It was great to do the Wagah border ceremony from the Indian side too having done it from here? Lots of peacock strutting and facing-off from the two sides. A kind of “my moustache is bigger than yours” scenario with crowds shouting support and drums beating out the incredibly up-tempo marching beat. What fun! 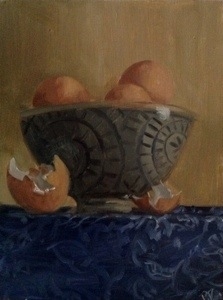 Anyway, back to the easel this morning and some clementines for your delectation. Have a lovely weekend. I’ve been busy prepping boards this weekend but still found time to walk in the hills and watch Andy Murray….what a pity. Anyway, last post till Friday as am off to Amritsar to see the golden temple….woohoo!